The senior football championship begins this Sunday, June 3, at the Irish Cultural Center, Canton Ma. 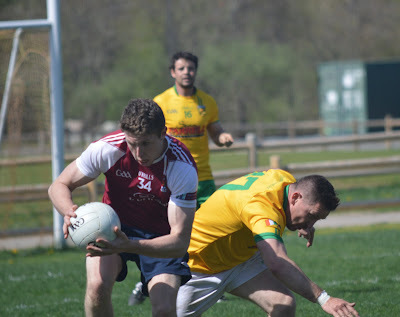 With the Irish Festival also taking place, Men’s and Ladies footballers will get the ball rolling for the season on the main field, while the junior hurlers of Portland and Hartford will do battle at 2:00 on Field B as part of the Junior C Hurling championship, which has already begun. With the Pat O’Brien Cup decided 2 weeks ago, action resumes with Aidan McAnespies and Galway. The early season spoils went to Aidan McAnespies who triumphed over Donegal in the Pat O’Brien Cup two weeks ago with a man of the match performance from Kildare native, Eoin Delmer. Galway will face last year’s championship finalists in the opening game at 1:15. Wolfe Tones and Donegal meet again having drawn their cup encounter 3 weeks ago at 3:45, while the Shannon Blues and the Connemara Gaels meet at 5:00. The Boston Shamrocks will defend the Orla Benson Cup at 2:30 versus Connacht Ladies. Judging from the May action on Field B, it looks like there are some strong home based panels out there. Paul Clifford, Eoin Delmer, and Robbie Croft are back for McAnespies, and the team also features Caolan Harvey who not so long ago (it seems) was cheering his father, Martin, on from the sidelines in Canton. Wolfe Tones also feature a second generation player in Jack Lynch. Jack’s father, Mick, was a stalwart for Cork. Still loyal to the rebel cause, Jack represents Cork at junior level. Dean Curran, Ronan Jones, and Conladh Deeney also look like featuring significantly for the Tones this year. Donegal will have brothers, Brian and Sean Donnelly ready to face the Tones, Darren Grant and Sean Tim Doherty ready to face the Tones on Sunday. Despite bowing out early in the cup, the Blues have a promising side with Darren Wallace and Dermot McElligott in the side and will face the Gaels whose long standing players include David Black, Coleman Mulkerrins and Noel Graham. With registration still open for the summer, clubs are adding to their home based panels. The Boston Shamrocks and Connacht Ladies will contest the Orla Benson Cup. It will be an all home based affair with s Shamrocks team featuring Cathy McEleaney, Ciara McCormack and Ann Marie McDonnell facing Jane Ward, Aisling Kerr, and Maria Kelly for Connacht. The annual competition carries on the memory of Orla Benson, a young student from Killarney who was brutally murdered in 1995 in Allston while in Boston for the summer.